The 1979 Red River Valley tornado outbreak was a tornado event that occurred on April 10, 1979, near the Red River Valley. It is noted for the F4 tornado that hit Wichita Falls, Texas, and is commonly referred to as "Terrible Tuesday" by many meteorologists. Additional ones were reported across the Southern Plains as well as in the Mississippi River Valley on April 10–11, 1979. The Red River, or sometimes the Red River of the South, is a major river in the southern United States of America. It was named for the red-bed country of its watershed. It is one of several rivers with that name. Although it was once a tributary of the Mississippi River, the Red River is now a tributary of the Atchafalaya River, a distributary of the Mississippi that flows separately into the Gulf of Mexico. It is connected to the Mississippi River by the Old River Control Structure. A deepening low pressure system formed in Colorado as a warm front lifted north pulling warm, moist, unstable air. There was strong upper level dynamics all coming together to produce strong tornado-producing supercells. In the early afternoon hours, three supercell thunderstorms formed. They moved northeastward, and as a trio spawned families of tornadoes. These supercells caused the most damaging tornadoes of the outbreak. Colorado is a state of the Western United States, and more specifically of the Southwestern United States, encompassing most of the southern Rocky Mountains as well as the northeastern portion of the Colorado Plateau and the western edge of the Great Plains. It is the 8th most extensive and 21st most populous U.S. state. The estimated population of Colorado was 5,695,564 on July 1, 2018, an increase of 13.25% since the 2010 United States Census. A warm front is a density discontinuity located at the leading edge of a homogeneous warm air mass, and is typically located on the equator-facing edge of an isotherm gradient. Warm fronts lie within broader troughs of low pressure than cold fronts, and move more slowly than the cold fronts which usually follow because cold air is denser and less easy to remove from the Earth's surface. This also forces temperature differences across warm fronts to be broader in scale. Clouds ahead of the warm front are mostly stratiform, and rainfall gradually increases as the front approaches. Fog can also occur preceding a warm frontal passage. Clearing and warming is usually rapid after frontal passage. If the warm air mass is unstable, thunderstorms may be embedded among the stratiform clouds ahead of the front, and after frontal passage thundershowers may continue. On weather maps, the surface location of a warm front is marked with a red line of semicircles pointing in the direction of travel. The first tornado formed near Crowell, Texas, at around 3:05 p.m. About 35 minutes later, the first killer one of the outbreak ripped through Vernon and killed 11 people. Then the supercell spawned one that killed three people in Lawton, Oklahoma. The second supercell spawned one that moved 64 miles (103 km). Crowell is a city in Foard County, Texas, United States. It serves as the county seat, and the population was 948 at the 2010 census, down from 1,141 at the 2000 census. Vernon is a city in Wilbarger County, Texas, United States. It is the county seat, and as of the 2010 Census had a population of 11,002. 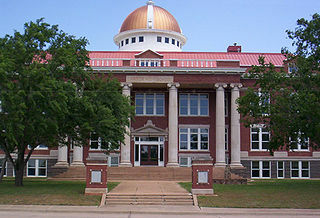 The city of Lawton is the county seat of Comanche County, in the State of Oklahoma. Located in southwestern Oklahoma, about 87 mi (140 km) southwest of Oklahoma City, it is the principal city of the Lawton, Oklahoma Metropolitan Statistical Area. According to the 2010 census, Lawton's population was 96,867, making it the fifth-largest city in the state. The third supercell was the one that formed the Seymour and Wichita Falls tornadoes as part of a three-member tornado family. The first one formed near Seymour at around 4:53 pm. The storm spawned a second one and moved through the south and east sides of Wichita Falls at around 6:00 pm. The third member of the family formed near Waurika, Oklahoma, at around 8:00 p.m.
Seymour is a city in and the county seat of Baylor County, Texas, United States. The population was 2,740 as of the 2010 Census. A tornado family is a series of tornadoes spawned by the same supercell thunderstorm. These families form a line of successive or parallel tornado paths and can cover a short span or a vast distance. Tornado families are sometimes mistaken as a single continuous tornado, especially prior to the 1970s. Sometimes the tornado tracks can overlap and expert analysis is necessary to determine whether or not damage was created by a family or a single tornado. In some cases, such as the Hesston-Goessel, Kansas tornadoes of March 1990, different tornadoes of a tornado family merge, making discerning whether an event was continuous or not more difficult. Waurika is the county seat of Jefferson County, Oklahoma, United States. The population was 2,064 at the 2010 census, a 4.36 percent decrease from 2,158 at the 2000 census. The Wichita Falls tornado formed in Archer County and moved northeast and damaged a few rural homes and high voltage towers. It rapidly intensified as it entered the city near Memorial Stadium by McNiel Jr. High on Southwest Parkway, which was located to the west of Wichita Falls at approximately 6:07 p.m. damaging both structures severely. Hail the size of golf balls preceded the touchdown and continued for approximately 15 minutes. It then became calm before the winds began to pick up. Archer County is a county located in the U.S. state of Texas. As of the 2010 census, its population was 9,054. Its county seat is Archer City. The county was formed in 1858 and later organized in 1880. It is named for Branch Tanner Archer, a commissioner for the Republic of Texas. The massive wedge tornado, which was at its maximum 1.5 miles (2.4 km) wide, cut a 2.5-mile (4.0 km) swath of destruction through the south side of town, leveling everything in its path. It destroyed an apartment complex near the beginning of its path. It also took its first lives there. It later destroyed a restaurant, the majority of Sikes Senter, the major mall, and another apartment complex where it took more lives. Neighborhoods all along Southwest Parkway were leveled and nothing but debris and destruction remained. A number of people tried to flee as the tornado moved along U.S. Highways 281 and 287. Roughly half of the 46 people killed were killed in their cars. It then moved into Clay County and changed its appearance to display a multiple-vortex structure. There were at times 5 separate vortices visible within the tornado. It inflicted additional damage south of Dean and Byers, but no more fatalities occurred. It crossed into Oklahoma where additional damage occurred before it dissipated. U.S. Route 281 is a north–south United States highway. At 1,875 miles (3,017.5 km) long it is the longest continuous three-digit U.S. Route. U.S. Route 287 (US 287) is a north–south United States highway. It is 1,791 miles (2,882 km) long. It serves as the major truck route between Fort Worth and Amarillo, Texas, and between Fort Collins, Colorado, and Laramie, Wyoming. The highway is broken into two segments by Yellowstone National Park, where an unnumbered park road serves as a connector. Clay County is a county located in the U.S. state of Texas. As of the 2010 census, its population was 10,752. The county seat is Henrietta. The county was founded in 1857 and later organized in 1860. It is named in honor of Henry Clay, famous American statesman, Kentucky Senator and United States Secretary of State. At the end of the outbreak, 54 people lost their lives in Texas, three were killed in Oklahoma and one was killed in Indiana. The Wichita Falls tornado alone killed 42 people and caused $400 million in damage ($1.78 billion in today's dollars). An 8 miles (13 km) swath of the city had significant devastation. F2 NW of Kingston Marshall 0705 0.1 miles (160 m) A trailer and three barns were destroyed. F2 SW of Eagletown to W of Big Fork (AR) McCurtain, Sevier (AR), Polk (AR) 1715 42 miles (68 km) 3 people were injured in a mobile home near the beginning of the path. Major damage in the Grannis area. Six homes, 19 trailers, and an elementary school were destroyed, where 4 students were injured. Two homes were also destroyed near Wickes. Tornado injured a total of 20 people and caused $1,750,000 in damage. F2 E of Hattieville Conway 1310 5.4 miles (8.7 km) Six barns and two homes were destroyed. Other homes, barns, and outbuildings were damaged. F2 NE of Bodcaw Nevada 2010 0.5 miles (0.80 km) Three homes were destroyed and others were damaged. F2 SW of Guy Faulkner 2015 3 miles (4.8 km) Several buildings were torn apart and a cemetery was damaged. Caused $190,000 in damage. F2 E of East End to NE of Lonoke Saline, Pulaski, Lonoke 2100 40.3 miles (64.9 km) Several trailers were destroyed. Damage also occurred to machinery, homes and outbuildings. F2 NE of Crossett Ashley 2210 10.4 miles (16.7 km) Tornado caused $3,500,000 to the downtown business district in Hamburg. Second tornado to strike Hamburg in three days. F2 NW of Black Rock Lawrence 2235 2 miles (3.2 km) Caused over $300,000 in damage to homes, barns, and a rock crushing plant. F2 E of McGehee Desha 2315 3.6 miles (5.8 km) Homes and businesses were torn apart in the McGehee area. Caused a total of $449,000 in damage. F1 NE of Libertyville St. Francois, Ste. Genevieve 2330 8.5 miles (13.7 km) A concrete block building was destroyed, and another was partially destroyed. A home was badly damaged, losing a large portion of its front side. Two barns were also destroyed and scattered across a field. F2 Liberty to SE of Barnesville Clay, Clinton 0100 20.1 miles (32.3 km) Several homes and businesses, a mobile home park, a church, and a school were damaged. Three barns were destroyed as well. 5 bus passengers were injured when they took shelter in a ditch, only to have the bus roll onto them. F2 S of Dycusburg to W of Bellville Crittenden, Webster, Henderson 0150 36 miles (58 km) Tornado tore a large section of roof from an elementary school near Robards. 5 people were injured when trailers were overturned. F2 SW of Boonville Vanderburgh, Warrick 0200 10 miles (16 km) 1 death – Moved from the east side of Evansville to north of Boonville. A shopping center and a lumber yard were damaged. 1 person was killed and two others were injured when the tornado struck a mobile home park. ↑ All dates are based on the local time zone where the tornado touched down; however, all times are in Coordinated Universal Time for consistency. The second Palm Sunday tornado outbreak occurred on April 11–12, 1965, in the Midwest U.S. states of Indiana, Ohio, Michigan, Wisconsin, Illinois and Iowa, with 47 tornadoes. It was the second-biggest outbreak on record at the time. In the Midwest, 271 people were killed and 1,500 injured. It was the deadliest tornado outbreak in Indiana history, with 137 people killed. The outbreak also made that week in April 1965 the second-most-active week in history, with 51 significant and 21 violent tornadoes. The 1947 Glazier–Higgins–Woodward tornadoes were a series of related tornadoes spawned by a single supercell that swept through Texas, Oklahoma, and Kansas on Wednesday, April 9, 1947. Most of the damage and all the deaths are still blamed on one large F5 tornado, known as the Glazier-Higgins-Woodward Tornado, that traveled nearly 125 miles from Texas to Oklahoma. This event was often compared to the Tri-State Tornado, because it was originally thought to have left a 219-mile path, but it is now believed to have a been part of a family of 8 or 9 tornadoes. The 1953 Waco tornado outbreak was a series of at least 33 tornadoes occurring in 10 different U.S. states on May 9–11, 1953. Tornadoes appeared daily from Minnesota in the north to Texas in the south. The strongest and deadliest tornado of the severe weather event was a powerful F5 on the Fujita scale. It struck Waco, Texas, on May 11, causing 114 of the 144 deaths in the outbreak. Alongside the 1902 tornado in Goliad, it was the deadliest tornado in Texas history and is the eleventh deadliest tornado in U.S. history. The tornado's winds demolished more than 600 houses, 1,000 other structures, and over 2,000 vehicles. Nearly 600 injuries occurred, and many survivors had to wait over 14 hours for rescue. The destruction dispelled a myth that the geography of the region spared Waco from tornadoes, and along with other deadly tornadoes in 1953, the Waco disaster was a catalyst for advances in understanding the link between tornadoes and radar-detected hook echoes. It also generated support for improved civil defense systems, the formation of weather radar networks, and improved communications between stakeholders such as meteorologists, local officials, and the public. The April 15–16, 1998 tornado outbreak was a two-day tornado outbreak that affected portions of the Midwestern United States, Mississippi and Tennessee Valleys on April 15 and April 16, 1998, with the worst of the outbreak taking place on the second day. On that day, 13 tornadoes swept through Middle Tennessee—two of them touching down in Nashville, causing significant damage to the downtown and East Nashville areas. Nashville became the first major city in nearly 20 years to have an F2 or larger tornado make a direct hit in the downtown area. The 1967 Oak Lawn tornado outbreak was a destructive tornado outbreak and severe weather event that occurred on April 21, 1967, across the Upper Midwestern United States, in particular the Chicago area including the towns of Belvidere and Oak Lawn, Illinois. It was the most notable tornado outbreak of 1967 and one of the most notable to occur in the Chicago area. The outbreak produced numerous significant (F2+) tornadoes, among them eight alone in the U.S. state of Illinois, including one of just six documented violent (F4–F5) tornadoes in the Chicago metropolitan area since the area was first settled. The F4 tornado that struck Belvidere caused one of the highest tornado-related death tolls in a single school building and was featured in an episode of The Weather Channel's Storm Stories. The 1896 St. Louis – East St. Louis tornado was a historic tornado that occurred on Wednesday, May 27, 1896, as part of a major tornado outbreak across the Central United States that day, continuing across the Eastern United States on the 28th. One of the deadliest and most destructive tornadoes in U.S. history, this large and violent tornado was the most notable of an outbreak which produced other large, long-track, violent, killer tornadoes. It caused over $10,000,000 in damage in 1896. 255 people died, and over a thousand were injured. More than 5000 people were homeless and lost all of their possessions. Memorial Stadium is an American football and soccer stadium in Wichita Falls, Texas located on Southwest Parkway at Barnett Road. It is owned and operated by the Wichita Falls Independent School District. The 1978 Bossier City tornado outbreak was an outbreak of 11 tornadoes that occurred during the early morning hours of December 3, 1978, in Louisiana and Arkansas. The outbreak produced several significant (F2–F5) tornadoes, several of which were long tracked. The first and most destructive of the tornadoes was a violent F4 tornado touched down on the eastern bank of the Red River in Bossier City, Louisiana, at approximately 1:50 a.m. CST. The tornado produced a path up to .5 miles (0.8 km) wide and nearly 4 miles (6.4 km) long through the heart of Bossier City. The only two deaths to occur in Bossier City were two young girls who were killed when a car was thrown through their bedroom wall. The Bossier City tornado became the fifth tornado in American history to produce at least $100 million (non-adjusted) in damage. The 1955 Great Plains tornado outbreak was a deadly tornado outbreak that struck the southern and central U.S Great Plains States on May 25–26, 1955. It produced at least 46 tornadoes across seven states including two F5 tornadoes in Blackwell, Oklahoma, and Udall, Kansas that caused most of the casualties. The outbreak killed 102 from three tornadoes while injuring hundreds more. Unusual electromagnetic activity was observed, including St. Elmo's fire. The 1905 Snyder, Oklahoma, tornado was a powerful tornado that struck the town of Snyder, Oklahoma, in Kiowa County on Wednesday, May 10, 1905. The event was one of the worst natural disasters ever to hit the state of Oklahoma. According to National Weather Service data, the cyclone killed 97 people, although the real death toll is not known because several missing people were not accounted for or found in the following days and weeks. The tornado was part of a larger, multiple-day tornado outbreak that hit several states across the Midwestern United States, including Kansas, Oklahoma, and Missouri. The tornado outbreak of April 10–11, 2001, was a large tornado outbreak which affected the central Great Plains on April 10–11, 2001. During the two-day outbreak, it produced a total of 79 tornadoes across eight states including Kansas, Missouri, Oklahoma, Texas, Nebraska, Iowa, Illinois and Michigan. Four people were killed, 18 injured, and more than $23 million in damage was reported. The fatalities were reported in Oklahoma, Iowa and Missouri including two from a single tornado in Wapello County, Iowa. The Early-April 1957 tornado outbreak sequence was a deadly tornado outbreak sequence that struck most of the Southern United States from April 2–5, 1957. The outbreak killed at least 21 people across three states and produced at least 72 tornadoes from Texas to Virginia. The outbreak was most notable due to a tornado that hit a densely populated area of the Dallas–Fort Worth metropolitan area, killing 10 people and injuring 200 or more. The tornado, highly visible for most of its path, was at the time the most observed and best-documented tornado in recorded history; hundreds of people photographed or filmed the F3 tornado as it moved just west of Downtown Dallas. The film of this tornado is still known for its unusually high quality and sharpness, considering the photography techniques and technology of the 1950s. Damage from the Dallas tornado reached as high as $4 million. Besides the famous Dallas tornado, other deadly tornadoes struck portions of Mississippi, Texas, and Oklahoma. Two F4 tornadoes struck southern Oklahoma on April 2, killing five people. Three other significant, F2-rated tornadoes that day killed two people in Texas and one more in Oklahoma. An F3 tornado struck rural Mississippi on April 4, killing one more person. In addition to confirmed tornadoes, a possible tornado hit Ballard County, Kentucky, on April 3, unroofing homes, destroying a drive-in theater, and uprooting trees. A loud roaring noise was heard. Two other brief tornadoes may have hit near Westlake and at Tallulah, Louisiana, late on April 4. The February 1971 Mississippi Delta tornado outbreak struck portions of the Lower Mississippi River Valley and the Southeastern United States on February 21–22. The two-day tornado outbreak produced at least 19 tornadoes, and probably several more, mostly brief events in rural areas; killed 123 people across three states; and "virtually leveled" entire communities in the state of Mississippi. Three violent, long-lived tornadoes—two of which may have been tornado families—in western Mississippi and northeastern Louisiana caused most of the deaths along 300 miles (483 km) of path. One of the tornadoes attained F5 intensity in Louisiana, the only such event on record in the state. The outbreak also generated strong tornadoes from Texas to Ohio and North Carolina. The entire outbreak is the second deadliest ever in February, behind only the Enigma tornado outbreak in 1884 and ahead of the 2008 Super Tuesday tornado outbreak. February 21 was the fourth-deadliest day for tornadoes in Mississippi on record. At one point, the National Weather Service WSR-57 radar in Jackson, Mississippi, reported four hook echoes, often indicative of tornado-producing supercells, simultaneously. The tornado outbreak sequence of May 1896 was a series of violent and deadly tornado outbreaks that struck much of the Central and Southern United States from May 15 to 28, 1896. It is considered one of the worst tornado outbreak sequences on record with tornado expert Tom Grazulis stating that the week of May 24–28 was "perhaps the most violent single week of tornado activity in United States history". There were four particularly notable tornado outbreaks during the two-week period. It produced three F5 tornadoes as well as the third deadliest tornado ever in United States history. A total of 484 people were killed during the entire outbreak sequence by at least 38 different tornadoes which struck Texas, Oklahoma, Kansas, Nebraska, Illinois, Missouri, Iowa, Kentucky, and Michigan. The March 1990 Central United States tornado outbreak affected portions of the United States Great Plains and Midwest regions from Iowa to Texas from March 11 to March 13, 1990. The outbreak produced at least 64 tornadoes across the region, including four violent tornadoes; two tornadoes, which touched down north and west of Wichita, Kansas, were both rated F5, including the tornado that struck Hesston. In Nebraska, several strong tornadoes touched down across the southern and central portion of the state, including an F4 that traveled for 131 miles (211 km). Two people were killed in the outbreak, one apiece by the two F5s in Kansas. The late-April 1909 tornado outbreak was a deadly tornado outbreak that affected much of the central and Southern United States between April 29 and May 1, 1909. Affecting particularly the Mississippi and Tennessee Valleys, it killed over 150 people, 60 of them in the U.S. state of Tennessee alone. It was the deadliest known tornado outbreak to affect Tennessee until March 21, 1952, when 64 people died statewide. To this day, the 1909 outbreak remains the second-deadliest on record in Tennessee—even the April 3–4, 1974 Super Outbreak and the February 5–6, 2008, Super Tuesday outbreak produced just 45 and 31 deaths each in the state. The 1917 May–June tornado outbreak sequence was an eight-day tornado event, known as a tornado outbreak sequence, that killed at least 383 people, mostly in the Midwestern and parts of the Southeastern United States. It was the most intense and the longest continuous tornado outbreak sequence on record, with at least 73 tornadoes including 15 that were analyzed to have been violent (F4–F5) based upon reported damage. The deadliest tornado of the entire sequence produced a 155-mile (249 km) track across Illinois, killing 101 people and devastating the towns of Charleston and Mattoon along with small farming communities. Once believed to have traveled 290-mile (470 km) cross Illinois and into Indiana, it is now assessed to have been a tornado family of four to eight separate tornadoes. The 1995 Great Barrington tornado was an F4 tornado that occurred in the western Massachusetts town of Great Barrington. The April 1920 tornado outbreak was a multi-day severe weather event that affected the Southeastern United States on April 19–21, 1920. The most intense portion of the outbreak occurred on the morning of April 20. At least seven tornadoes affected the American U.S. states of Mississippi, Alabama, and Tennessee, six of them rated violent F4s on the Fujita scale. At least one of them may have attained F5 intensity, though this is uncertain. The tornado outbreak killed at least 243 people. This page documents notable tornadoes and tornado outbreaks worldwide in 1973, but mostly features events in the United States. According to tornado researcher Thomas P. Grazulis, documentation of tornadoes outside the United States was historically less exhaustive, owing to the lack of monitors in many nations and, in some cases, to internal political controls on public information. Most countries only recorded tornadoes that produced severe damage or loss of life. Consequently, available documentation in 1973 mainly covered the United States. On average, most recorded tornadoes, including the vast majority of significant—F2 or stronger—tornadoes, form in the U.S., although as many as 500 may take place internationally. Some locations, like Bangladesh, are as prone to violent tornadoes as the U.S., meaning F4 or greater events on the Fujita scale. ↑ Brooks, Harold E.; Charles A. Doswell III (February 2001). "Normalized Damage from Major Tornadoes in the United States: 1890–1999" (abstract). Weather and Forecasting . American Meteorological Society. 16 (1): 168–76. Bibcode:2001WtFor..16..168B. doi:10.1175/1520-0434(2001)016<0168:NDFMTI>2.0.CO;2. 1 2 3 4 5 6 7 8 9 10 11 12 13 14 15 16 17 18 19 20 21 22 23 24 April 10, 1979 Storm Data (Report). Tornado History Project. Retrieved January 20, 2014. 1 2 3 4 5 6 7 8 9 10 11 12 13 14 15 16 17 18 19 20 21 22 23 24 Grazulis (1979) (Report). Thomas P. Grazulis. Fujita, T.T., and Wakimoto, R.M. (1979). "Red River Valley tornado outbreak of April 10, 1979", University of Chicago. 1. These are the unadjusted damage totals in millions of US dollars. 2. Raw damage totals adjusted for inflation, in millions of 2018 USD. 3. A search of NCDC Storm Data indicates no tornadoes between 1999 and 2010 have caused more than $400 million in damage.